To me, having received Zhiyong’s verdict is like turning over this page in my life. Though we will still appeal in order to create some space for Ding Jiaxi and the others whose case is still pending in the Haidian court, the appeal trial won’t change anything. In fact, before the indictment in this case was ever sent to the court, a “special case unit” including officials from the Beijing High People’s Court had already been set up. During the trial on 22 January, the heads of the Beijing public security bureau, procuratorate, and court—Fu Zhenghua, Chi Qiang, and Mu Ping—were all watching the proceedings in their entirety from the video room. When I took on the job of being Xu’s defense counsel, many friends inside the system kindly reminded me to take note of the sensitivity of the case and avoid saying or doing anything too radical. I always asked them not to worry and replied that I would pursue a defense in accordance with the law. Although I will still serve as Zhiyong’s defense counsel during the appeal, I will not submit any defense opinion to the appeals court, because I don’t recognize its legality. 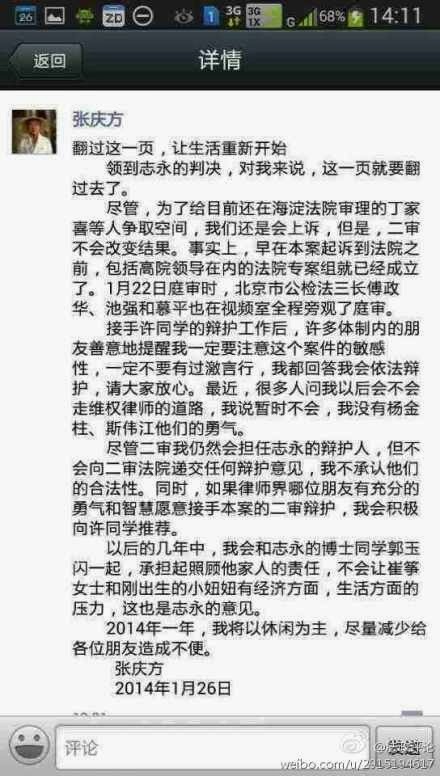 Also, if any lawyer friends has enough courage and knowledge and is willing take on the role of second-instance defense counsel in this case, I will actively recommend them to Xu. For the next few years, I and Dr. Xu’s classmate Guo Yushan will take responsibility for looking after his family. We shall not let Ms Cui Zheng and their newborn daughter want for anything economically or face other life pressures. This is Zhiyong’s wish. In 2014, I will mainly rest and do my best to avoid causing any inconvenience to all of my friends.